The Ben & Anna Vanilla Orchid Natural Deodorant Stick Papertube offers effective protection against moisture and odors of perspiration.Its richness in baking soda prevents the proliferation of bacteria without blocking the natural process of perspiration. Shea butter and coconut oil make your armpits soft and fresh. Its fragrance with warm and sweet notes of flowery vanilla awakens the senses. Associated with calendula, this divine scent provides a soothing sensation. Environmentally friendly, it has a recyclable cardboard packaging which makes it a hygiene care zero waste. 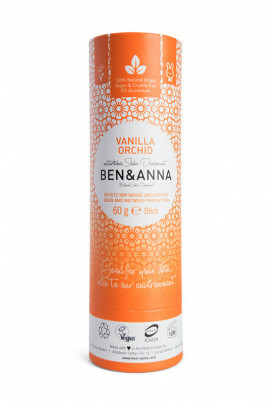 The Ben & Anna Vanilla Orchid Natural Deodorant Stick Papertube is ideal for sensitive skin who want softness! A natural and vegan deodorant that respects the skin! Easy to apply, just bring out the deodorant by pressing on the bottom of the recyclable cardboard tube. To use on clean armpits and not irritated. Natural ingredients for a gentle and effective deodorant!